On the Main Line: Shadal series #7 - on alienation from his teachers, and a public retraction. Shadal series #7 - on alienation from his teachers, and a public retraction. Shadal was largely an autodidact, but he had four primary teachers. One was his father, with whom he studied Torah from the time he was 3 years old. Another was his adult cousin, with whom he studied daily for two and a half years beginning from the time he was 16. In between he also had some formal schooling in the persons of Rabbi Mordechai Yitzhak Cologna and Rabbi Abram Halevi. Cologna taught in the local Talmud Torah school, and from him he learned Mishnah, Dikduk, Rashi, Radak, and Latin. As I've mentioned before, he wrote at least three separate autobiographies. In the first one, written in Hebrew in 1837, he says that he felt the following about Cologna: את המלמד הזה היה ש"ד ירא יראת הרוממות גדולה מאד, והיה עושה אזנו כאפרכסת לכל דבריו ולכל שיחה קלה שהיה מדבר עם מי שהיה, והיה האיש ההוא בעיניו לאות ומופת and Shadal credits him with arousing within him a love and appreciation for Hebrew grammar and other good qualities ממנו באה לש"ד אהבת חכמת הדקדוק ואהבת הדיוק בכל פעולותיו ובכל עניניו, וגבורה למשול ברוחו ולכבוש את יצרו ולמאוס בתענוגים; והתכונה הזאת היתה לו לישועה גדולה ולפורקן בימי בחורותיו. Not surprisingly, if someone is viewed with such awe they can fall far from the lofty view, especially if the person is very sensitive, as we shall see. Shadal stopped attending the school due to an illness at age 13. While in school, he had been studying Talmud with Rabbi Avraham Eleazar Halevi, the Chief Rabbi of Trieste. After recovering from this illness, he continued studying him for several years, until an incident occurred which caused him to stop coming to him. He writes that sometimes his fellow students misbehaved and would horse around, and at times he would also join in. For example, he writes, sometimes he would say something very pretentious and intellectual sounding and give his friends cause to laugh. The rabbi would rebuke the students when this occurred. One time he mistakenly chastised Shadal, saying "Se non avete a venire che per fare il לייצן (buffone) potete fare a meno di venire," "If you came here to play the fool, don't bother coming." Evidently this was more than this sensitive boy could take, so he stopped coming. In the meantime, he had been visiting Cologna, who had become blind in his advanced age. He would read to him and assist him in other ways, such as taking dictation. After he had stopped going to his Gemara shiur, naturally he still continued to visit Cologna. He writes that unfortunately coming into close contact with this teacher, whom he venerated as a child, caused him to diminish his opinion of him. One or two months after the incident with the rabbi, when it happened to be Shadal's 16th birthday, Rabbi Avraham had returned home from his summer vacation, and Cologna asked Shadal to send him his greetings. This he was unwilling to do, as he had stopped coming to his class! He says that he lacked the courage to either send the greeting or confess to Cologna the reason why he would not go. Finally, in disgust, Cologna instructed him to accompany him to the rabbi himself, and all the while he lectured him in the finer points of Derech Eretz, how it precedes Torah, etc. Shadal said he became more and more embarrassed and apprehensive, but he had no choice but to go along with him. Lucky for him, the rabbi was out. His widowed daughter answered the door, and Cologna conveyed a very poetic greeting, quoting the Talmud Taanit 5a "Tree, O Tree, with what shall I bless thee? Shall I say to thee, ‘May thy fruits be sweet’? They are sweet already; that thy shade be pleasant? It is already pleasant; that a stream of water may flow beneath thee? Lo, a stream of water flows already beneath thee; therefore [I say], ‘May it be [God's] will that all the shoots taken from thee be like unto thee’. So also with you . . ." He added, to the daughter, who was simple and unlearned, that he knows that she understood what he had said in Hebrew. All the way back he continued lecturing Shadal on Derech Eretz. Shadal felt nauseated by the display. He felt it was not Derech Eretz at all, but a form of false flattery since he was of the belief that Cologna didn't really hold such a high opinion of the rabbi, who had been born in Eretz Yisrael, and dressed and acted in typical 'Asian', rather than Italian, fashion. It was also a showy display which in reality shamed the daughter. So he stopped coming to him. It was at this time, he writes, that God sent him his older cousin with whom he would study daily . . .
Not surprisingly, when this appeared in print - all the sources will be shown below - there were other students of Cologna who were appalled by this, notwithstanding that Shadal had prefaced the good, the bad and the ugly in his autobiography with a kind of disclaimer about how, gosh, he has no choice but to speak the truth. After speaking to some of these people on a visit to his hometown of Trieste, he sent Hamaggid a public retraction, where he sings Cologna's praises and notes that his other students experiences him in a different way, and they are the fine products of his tutelage. However, he hardly denies that he experienced what he experienced. This is interesting, because Shadal's general way was that he was ready, willing and able to retract his opinion publicly when he became convinced that he had been mistaken. This seems to me to be the only example where he budged on his opinion at all, where he was not quite convinced that he had been mistaken! As you can see, he explains that before forming his negative opinion he had viewed Cologna as almost an oracle. He also says that he became convinced that his sermons were empty, because he eschewed the peshat, favoring the style of derash. Furthermore, they were designed to show off his bekius (breadth) and charifus (sharpness) rather than to discover the truth. He says that his concept of Derech Eretz was political, and he saw him as a flatterer. He basically says "In Trieste I heard from some honest and honorable men, students of Rabbi Mordechai Yitzhak Cologna z"l, that they were a bit pained by my detraction from his honor. What could I do? The love of truth caused me to tell things which aren't Derech Eretz to say. But for the honor of the truth, I will reiterate that this scholar, apart for his great knowledge in Torah, secular subjects, and languages, was a tzaddik and chassid, a propounder of Torah to many, and implanted in the hearts of his students yirat shamayim and good traits; lucky is the community which had a man like him dwelling in their midst. I see that the negative impression which he formed on me from his sort of Derech Eretz was not formed on his other students; not even one of them attributed it to him. Not even one of them was able to accept a dimunition of his ways and attributes, and they studied and assisted this scholar. From this I see that the man was guiltless, and his manners elevated all who were close to him. Therefore, he was good and lofty in all his ways; and this one student annuls his . . . " Now, I know that some could be forgiven for seeing this as sarcastic. I suspect though that it isn't, since I truly think he would not have thought twice about openly standing by what he wrote. I assume that he was genuinely surprised that the others didn't perceive Cologna this way, but seeing as they didn't, he took it back. I thought it would be interesting to bring up an unrelated context, where Shadal mentioned Cologna as an exemplar of an Italian rabbinic type. 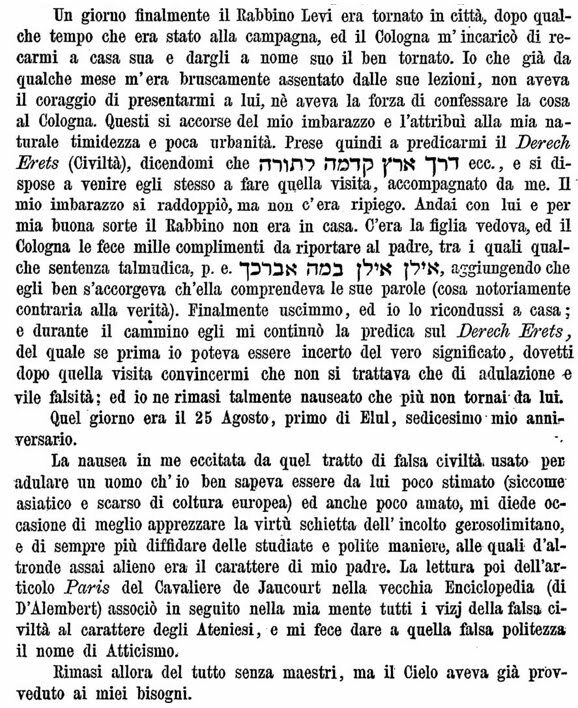 In 1840 the Archives israélites has written a little bit about the Rabbinical College in Padua (which Shadal co-headed) and described it negatively as belonging to the last century, being inspired by the principles of reason espoused by Mendelssohn, and the "Biourim et des Measphim" (the Biurists, i.e., Mendelssohn and his circle, and the Meassephim, i.e., the early Hebrew Haskalah writers). But, it continued, real successors are supposed to take the end point as a starting point. The school may decline to listen to the voice of Reason calling out, "March, March!" but no amount of training in oratory or flowery poetry is powerful enough to drown out that voice. In other words, the school is too frum. If under the rubric of Mendelssohn's principles is the belief that Moses was a true prophet, worker of true miracles, and that his law is still binding for all of Israel, then he is quite right that Reggio and Luzzatto adopt the principles of Mendelssohn. But they do not recognize these principles by Mendelssohn; they recognize them from the same ancient source which Mendelssohn took them. This great man exercised a great influence over the Jews of Germany and the Northern countries, but only a little over the Jews in Italy, who were not in any century strangers to scientific culture. My principle teacher, Rabbi Mordechai Isac Cologna, was a profound Latinist and a good surveyor. My father, only a turner by trade, knew mechanics well, and studied the works on physics by Benjamin Martin . . .
Getting back to R. Abraham Eliezer, although it doesn't take a genius to read between the lines and realize there was more going on besides a perceived insult, Shadal never wrote a negative word about him. In fact, everything he wrote about him shows that he admired him. He describes how when the rabbi was pained with gout, he didn't cancel the lessons; he would have the pupils come to him while he lay in bed, in pain, and taught. Although his style of learning and teaching didn't match with Shadal's conception of peshat to say the least, he praises him for it. In the Italian, he writes: "Era profondo ed acutissimo nel Pilpul, ma era un Pilpul rotto, nòn mai sofistico, come pure la sua religiosità era rigida, ma sincera./ His style was deep and sharp Pilpul, but not a broken sort of Pilpul, and without sophistry. His style of religion was rigid, but sincere." Indeed, part of the Cologna incident was over the fact that he felt that Cologna didn't sufficiently respect Rabbi Avraham! He does, however, write that after he stopped coming to his class, he didn't speak to him again for another 9 years, when some communal leader gave the rabbi a copy of Shadal's newly published Kinnor Na'im. Evidently the rabbi liked it, for he bestowed upon him the title Maskil (the Italian equivalent of Chaver). the practical implication is that the title would be used when he would be called to the Torah. He also wrote that while he was still learning with him, the rabbi encouraged him to learn, promising him that if he did he would ordain him at age 20. Shadal, however, had other plans. So the rabbi remarked, "Luzzatto wants to be a Chacham, not a Rav." 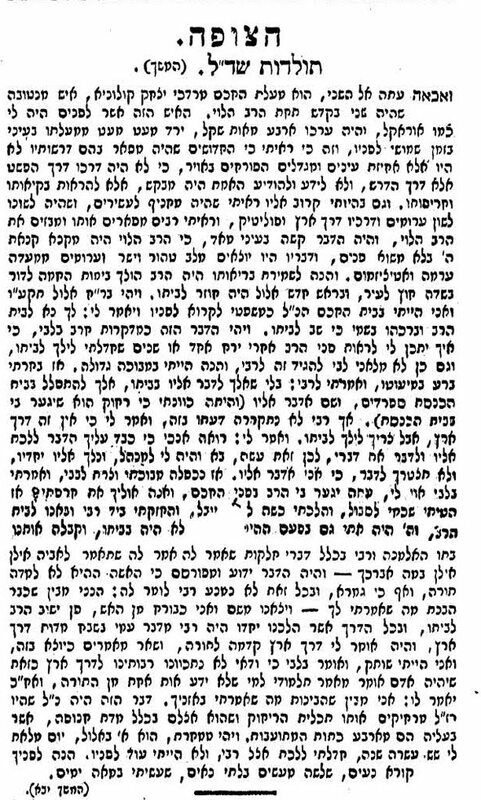 I will have more to say about Rabbi Avraham Eliezer of Trieste, who corresponded with the Chasam Sofer, in another post. But while frequenting Rabbi Levy's school I had been in the habit of visiting Cologna—he who had in my childhood inspired me with love for Hebrew grammar. The unfortunate man had become blind, and I would read to him, or write under his dictation what he needed. For, though deprived of sight, the old man continued preaching every Sabbath, and in his lectures he used to quote not only Hebrew authors, but also Italian and Latin. And here let me acknowledge that the profound veneration I had conceived in my earliest days for that teacher of mine lost much of its depth when I learnt to know him thoroughly. What I had deemed vast knowledge seemed to me now to have been an effort of the memory to retain a given number of things rather than the offspring of a far-reaching intellect. The ideas, which his mind created and which ran through the whole of his sermon, were hair-splitting arguments. His character also, assumed in my eyes the appearance of Egotism, when I perceived that he never would ask me to read what might have contributed to my improvement, but only what proved to his advantage. I felt so, more particularly, because my father had begged that he would let me practice Latin occasionally. His self-love was of a lower grade, for he enjoyed hugely the applause of shallow-pated fellows who admired some of his hackneyed remarks. The poor man might deserve a less severe judgment, and I do not mean to set myself up for a judge; but as my own historian I register the opinion formed upwards of thirty years ago. The opinion was strengthened by what follows. Rabbi Levy, who had been staying for some time in the country, had returned to the city. Cologna requested that I would go and welcome him in his name. I, who had left abruptly and not attended the Talmudical lessons for several months, did not have the heart to do the errand, nor could I summon moral courage to confess the cause. Cologna noticed my embarrassment and attributing it to my natural timidity and want of politeness launched into a long dissertation on Derech Eretz (good breeding), quoting the Sages to show that even before the Law had been delivered the world was governed by the inborn sentiment of what is due to one another, and so he went on, preparing to go himself, under my lead, to the Rabbi's house. My embarrassment increased, but there was no alternative, I had to submit. Luckily Rabbi Levy had gone out. His widowed daughter, however, was in, and Cologna lavished upon her compliments, which he asked might be conveyed likewise to her father, concluding with the Talmudical parable of the traveler and the tree. “O tree! What blessing shall I bestow on thee?....... May thy fruit be always as sweet as it is now;” adding, that he knew well she understood what he had said in Hebrew, though he knew better than that. We left the house together and going back he did nothing the whole way but preach to me his “Derech Eretz,” the meaning of which, if I had not rightly caught before, I learnt perfectly from the visit just made. It was flattery and vile deception. So nauseated did I get with it, that I did not repeat my visits to Cologna's from that very day, which happened to be the 25th of August corresponding with the 1st of Elul, the anniversary of my birthday. The disgust I experienced at that false politeness, practiced towards a man, lightly esteemed—because he was Asiatic and deficient in European culture—and little loved by Cologna, stirred within me a sense of greater appreciation for the unvarnished virtue of him who had been born in Jerusalem, and of distrust for very polished manners. In some sources he is called Angelo Isach. 'Angelo' was the common Italian kinnui for Mordechai, some say because the Talmud identifies Mordechai and Malachai. 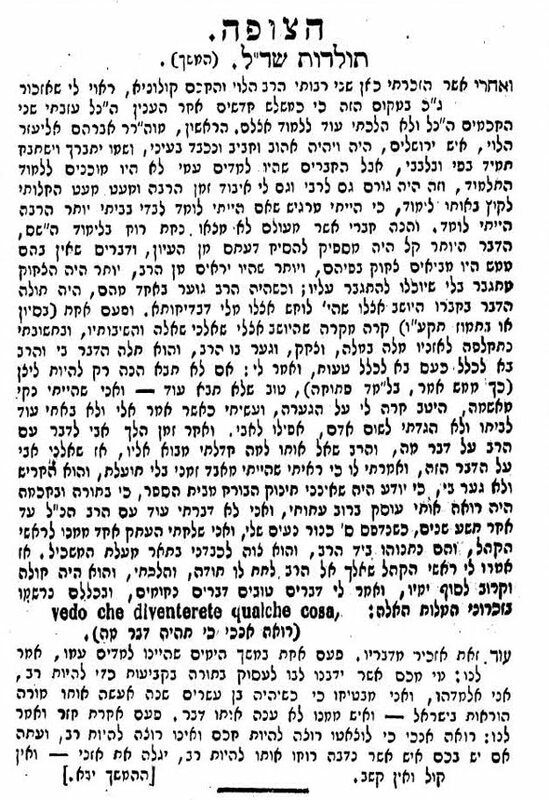 As it happens, Shadal himself calls him "Marco Isac" or "Mordechai Isac" in his own writings in Italian, never Angelo. In any case, this aforementioned rabbi died in 1824. I'm not sure what year he was born (even Asher Salah doesn't seem to know, for he doesn't mention a year of birth (or death) in his Le république des lettres: rabbins, écrivains et médecins juifs en Italie au XVIIIe siecle). However, Cologna's half brother was the more famous Rabbi Abram Hai de Cologna, who served as a leader in Napoleon's Sanhedrin, and subsequently as Chief Rabbi of Paris, and eventually Padua. He was born in 1755 and died in 1832. Presumably then Mordechai Yitzhak was born a little before or after 1755. In addition to teaching in the Trieste Talmud Torah, he also served as the interim Chief Rabbi, before R. Avraham Elazar Halevi was picked. Afterwards, he served as a kind of vice-rabbi; for example, one of his duties was delivering sermons in the synagogue. Yeedle, yes, he mentions Cologna by name (p. 33). Anon, he was a wood turner. Ah so it's Cologna he mentions there. This is interesting, because I seem to rmemember that Shadal writes very warmly on him, not indicating that he became, how should we say, disenchanted from him. Might be he really changed his mind about Cologna or that in Vikuach he wishes - for polemical reasons - to portray Cologna as smart and holy. Great posting -- just one quibble. 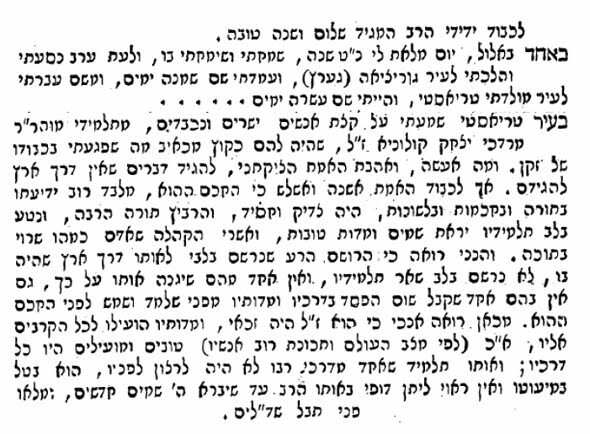 Where Shadal says that Rabbi Halevi's style was deep and sharp Pilpul, he goes on to say "ma era un Pilpul rotto, non mai sofistico," meaning "but *it was* a broken sort of Pilpul, and without sophistry." Apparently Shadal preferred a "broken" and unassuming pilpul to its overly clever and polished variety. A primitive guide to safrut from Boston, 1763. Hebrew prayers for three condemned Jews, 1739. A work by Abraham Ger of Cordoba. How is Sforno's name really pronounced?